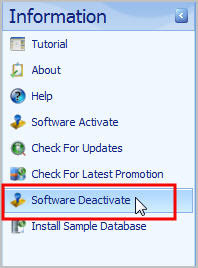 Software deactivation is different from uninstall. Deactivation is recommended when the existing PC is not in good operating condition such as malfunction, obsolescence. User can request to transfer the valid license to another PC with administration fee of USD 50. New Serial Number will then be generated and sent to user for reactivation. User must take note that once eStockCard is deactivated, the license for old PC will revert to Free Edition. eStockCard still workable but with limitations. User wish to reactivate eStockCard at the old PC again, the Old Serial Number can’t be used and New Serial Number must be obtained from Chronos and this is still considered as transfer of license and administration fee of USD 50 will be imposed. Hence, you must think carefully if you insist to deactivate. Go to Information > Software Deactivate. 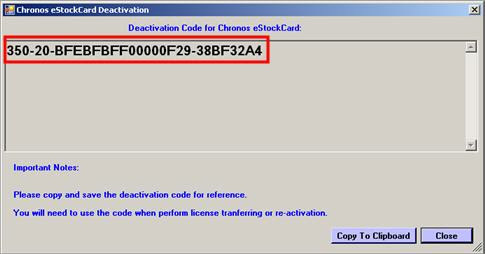 Copy the deactivation code and send to Chronos. Backup the database at the old computer. Deactivate the license and send back the deactivation code to us for verification. Chronos will send a new Serial Number to you for activation. After activate the license, restore the database to the new computer. Go to Tools > Data> Data Maintenance. Select “Backup Database – Backup database now” and click “Next”. By default, system will save the backup file to the eStockCard Data folder. To choose another location, click “Change” and select your location. Copy and save the backup file (e.g. eStock_Thursday.bak) to the new computer. Login to Chronos eStockCard which you have installed at the new computer. Go to Tools > Data > Data Maintenance. Select the second option “Restore Database – Restoring database from previous backup file” and click Next. Please select the backup file e.g. eStock_Thursday.bak that you have saved in this new computer then click Restore Now button. Your data from the old computer will be restored to this new computer.